A new set of videos have been released by Michael Reichmann and Jeff Schewe providing an advance guide to the new features within Lightroom 5. Many will be familiar with previous releases from the duo which have covered every Lightroom version from LR1 beta onwards. These have proved a popular resource for those hoping to gain a deeper insight to the workings of Adobe Lightroom. This release is slightly different from the rest and a clue is in the title. 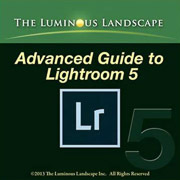 It’s purely an advanced guide, so not aimed at beginners, and only covers the additions made to Lightroom in version 5, so does not, as in previous releases, include the entire package. I can’t remember where I saw this simple, and very effective tip, but it’s one I’ve found particularly useful so I like to present my particular take here. I’ve must admit I’ve always found the Panel End Mark displayed at the bottom of each panel rather odd. They seem rather superfluous and in total contrast to the sleek streamlined interface displayed elsewhere throughout Lightroom.